David Ortiz hit the DL this week with a tear in the sheath that surrounds the tendon in his left wrist and although Big Papi thinks he can be back in a month, many think that the injury won’t heal in that time and may require season-ending surgery. If that is in fact the case, I can’t help but think that the Red Sox will be looking to their crimson brothers-in-arms, the Cincinnati Reds for an offensive boost. Adam Dunn and Ken Griffey Jr. both figure to be available and both could help the Sox in multiple ways. Griffey and Dunn are both left-handed hitters who could provide solid numbers in the three-hole for the Red Sox. Both have significant power. Both have the ability to play the corners at Fenway and/or DH-alternatively with Manny Ramirez. But most importantly…Cincy is most-likely looking to move both of them in order to save some serious cash and gain more prospects for the team’s on-going youth movement. In Griffey, the Sox would essential acquire a rent-a-player for the season, but if they are successful, perhaps Griffey would want to stay longer and make another championship run…something he isn’t likely to do if he returns to Seattle as most people are predicting he will. 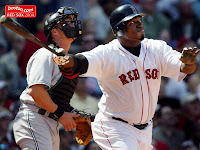 They would also acquire one of the best players of this era–albeit on the downside of his career–and someone who would seemingly fit in very well with the Boston clubhouse. In Dunn, the Sox would receive a powerful 28-year-old who appears to just be entering his prime and has raked to the tune of 40 homers (or better) for each of the last four years and is on pace to do it again in 2008. Dunn would be a wise signing if the Sox decided not to exercise Manny’s option after 2008, as he could play the small left field at Fenway just as admirably as Manny and put up similar offensive numbers. However, with the uncertainty surrounding Big Papi’s injury and his history of wrist-injuries, perhaps it’d be in the Sox best interest to sign Dunn and Ramirez and “worst-case scenario”, David Ortiz comes back healthy and mashing and the Sox find that they have an overload of offensive talent. What a sad situation that would be for Sox, huh?! What would it take to land Griffey or Dunn? To get Griffey it would probably cost the Sox at least one solid pitching prospect (not named Masterson) most-likely Charlie Zink or Craig Hansen. The Reds would probably also want to land an outfielder in the deal such as Jeff Bailey or Chris Carter. It may cost the Sox a little more to land Dunn, due to his age and current value to the Reds line-up, it might take Justin Masterson and some combination of Jed Lowrie, Brandon Moss, Zink, Bailey or Carter. Although given the proven skills of both Masterson and Lowrie the Sox may be able to get away with one of those two and a lower level prospect. It benefits the Reds because, even with the youth-movement in full swing, they don’t appear set to contend in 2008. If the team doesn’t choose to sign Dunn long-term (which would be a mistake) then he and Griffey both should be moved before walking away and leaving the team with nothing to show for it. The Reds can gain some high-ceiling prospects from the Red Sox and continue to keep their farm system stocked and keep the infusion of young talent coming, that way the team isn’t forced to rely on the likes of Corey Patterson beyond the 2008 season. …I’d love to hear ’em?! 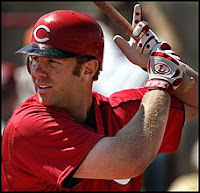 This entry was posted in Adam Dunn, Baseball, David Ortiz, Ken Griffey Jr.. Bookmark the permalink.